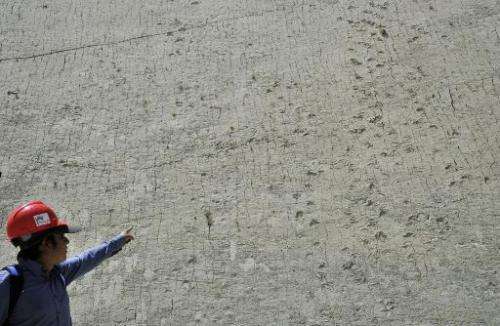 A hill in southeastern Bolivia is crisscrossed by fossilized dinosaur tracks—a total of more than 5,000 footprints, some more than a meter long, dating back 65 million years. But preservationists say this paleontological treasure is at risk—thanks to human activity that threatens the ground they rest on. Cal Orcko, which means "lime hill" in the local Quechua language, on the outskirts of Sucre, is one of the biggest sites for fossilized footprints ever found. Most of the tracks have been traced to massive titanosaurs, king carnivore theropods, "bird-hipped" ornithopods and armored ankylosauruses, although experts estimate more than eight species are represented. The site is a huge draw for tourists, welcoming some 120,000 visitors a year. "Tourists are amazed, surprised," said Juan Carlos Molina, who lives nearby. But, also nearby, is a cement factory, Fancesa, which constantly pulls limestone out of the neighboring quarry. Fancesa is owned by the regional government, the city government, and the local university. 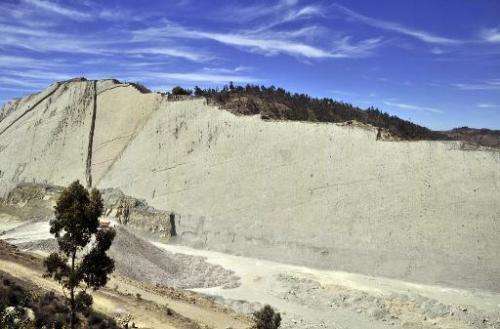 "The cliff has been quite affected by the many years of extracting the raw material," said Elizabeth Baldivieso, administrator of Cretaceous Park, the private foundation that protects the fossil field. 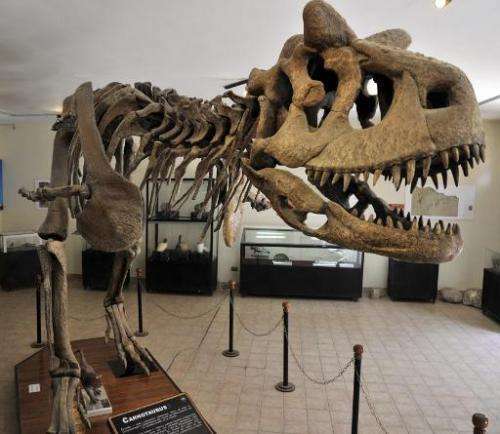 However, regional Tourism and Cultural Secretary Juan Jose Padilla disputed the warning, calling Baldivieso's description "somewhat alarmist" and noting that Fancesa has pledged to help protect the site. The fossilized tracks on Cal Orcko are more extensive than at other reserves, including Australia's Lark Quarry, China's Yanguoxia, and Spain's Altamira, according to an investigation by the park. 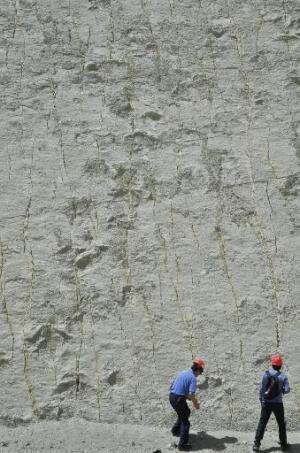 The tracks appear to be climbing an almost vertical outcrop, a fact that always prompts questions from visitors, said Bolivian researcher Omar Medina, of the local University Scientific Society of Paleontology. But back when the dinosaurs wandered there, the slope—which measures around 1.5 kilometers (one mile) long and is at an altitude of 120 meters (390 feet)—looked very different. Some 65 million years ago, the land was muddy and flat. With the passing of time, "movements of tectonic plates, skid plates and marine continents" beneath the surface pushed the ground into its nearly upright position, while the mud also dried into limestone. The footprints were first discovered in the mid-1990s, when rain and erosion uncovered them. Another part was discovered when the cement factory started exploiting the nearby quarry. Bolivia proposed designating Cal Orcko as a UNESCO heritage site in 2009, but the cement company opposed the measure, noting the existing preservation policies. But the project is being reformulated and should be resubmitted in 2015. Regardless of the nearby mining, being exposed to the elements likely isn't beneficial. Even without the mining, how long will the prints last?